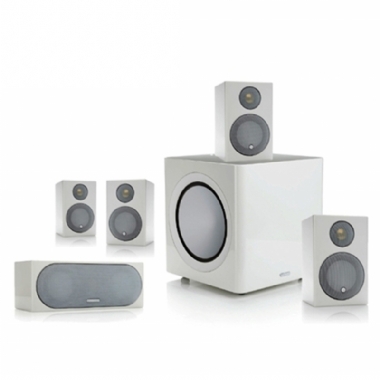 Monitor Audio Radius R90HT1 5.1 AV Speaker Pack. Available with Online Finance and Free Delivery. The Radius 90 speakers feature a new version of Monitor Audio’s 25mm C-CAM (Ceramic-coated Aluminium/Magnesium) tweeter - and gone are the plastic mid/bass drivers of the previous generation. For the first time in the Radius range, the tweeters are also now made from C-CAM. Monitor Audio claims the new cones boast lower distortion and greater force than the older model. They’re also capable of longer excursion, which is why Monitor Audio has had to enlarge the grille with a slightly more bulbous profile. The Radius 200 centre channel is a brand-new speaker. It uses two 4in C-CAM drivers (compared with just one plastic one on the old R180), with one on either side of the new tweeter. The Radius 390 subwoofer is a fresh design too. More cubic in appearance than before, it now fires sideways as opposed to downwards on the older models. It uses a 25cm C-CAM driver on either side, one of which is a passive, specially tuned ABR (Auxiliary Bass Radiator). The 390 is powered by a 220W amp. This package should blend in with most living rooms, especially if you have the speakers hugging a wall. Even the Radius 390 subwoofer looks stealthy enough not to intrude too much. As a home cinema 5.1 speaker configuration the Monitor Audio Radius R90HT1 is very special as it blends the traditional compactness of the Monitor Audio Radius Speakers with a level of performance which move the game of audio excellence forward in ways which we though could not be achieved. So, if your looking for a sub sat surround sound speaker package, which has that big speaker sound quality, one that will delight and enrich your listening experience with clarity, pace and precision then your search is over as no other 5.1 speaker package will deliver in quite the same way as the Monitor Audio R90HT1. What HiFi recently gave the R90HT1 a 5 Star Review & Best Style Package £1400-£1800 and stated "This package sounds wonderfully cohesive and entertaining – it’s up there with the very best at this price"